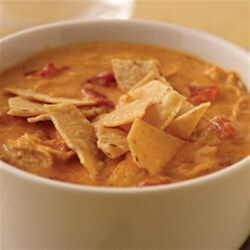 "This quick video shows you how to make our cheesy (and oh-so-easy) tortilla soup. Find out firsthand why it's one of our top-rated recipes!" I would make this as a dip rather than a soup. It was very thick and all velveeta. Maybe add more chicken broth and less cheese? Next time! Love this soup! Creamy and not too spicy. I did add diced red peppers, celery & carrots with the onions but only because I like veggies. Keeper...used a can of rotel and a 14oz can of diced tomatoes, added extra chicken broth cause we like it thinner and more soup like. Tasted awesome, and was super easy to make.